Everywhere I go, I carry a pen and a stack of 3×5 index cards held together by a binder clip. It’s a Hipster PDA 1.0, from before all those apps got installed. On one of these cards are the words: “Entrepreneurship is alive and well at the Anarchist Book Fair”. I wrote them last spring, during a trip to Montreal. This is kind of condescending thought that runs through my head when I see idealist-ideologues try to navigate the shoals of reality. The book fair is annual. It’s a focal point – the anarchist social event of the year. People travel from all over Canada and the U.S. to visit friends, network, run workshops, and party. The contradictions don’t seem to bother anybody. It’s literally an anti-capitalist marketplace, crammed to the gills with people selling books, t-shirts, pins and paraphenilia. It’s a weird, vibrant mirror of a county craft fair, complete with live music, hidden bottles of booze and a snack booth (vegan, organic and sustainable, we are told). And why not? 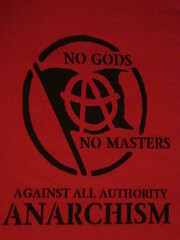 Anarchists need to eat, same as everyone else. The clothes are fashionably ragged, instead of old and faded. The patches are silkscreened with black instead of embroidered in red white and blue. There are cupcakes. When the police stop by to let the organizers know that the skinhead rally has been broken up, they get booed. Capitalism is on the run, have you heard? The Financial Times is running a whole series on what comes next. I wonder what the fair will feel like this year. What will the mood be? Triumphant told-you-sos? Gleeful excitement at the opportunities for effecting change? Will there be the same cold worry that the rest of us feel, that the collapse might be real and total and we might not get back up? I’ve met them. When they aren’t writing autonomous anti-oppressive zines, they work in the service industry. They don’t have severance packages, they have 2 weeks notice. And they are living paycheque to paycheque or worse. How many anarchists will look in their wallets and decide they can’t make the trip this year, due to the impending collapse of capitalism. Does it sound like I am making fun of these contradictions? I assure you I am not. It’s these kinds of barely held tensions that keep a movement alive and dynamic. And we need a vibrant anarchism. We need one that is not caught up in internal struggles of self-definition and specialist rhetoric. Come what may, there is a lot of work that needs doing that doesn’t necessarily get done by businesses anymore. The more people offering solutions, the more likely it is that one gets found. Who am I kidding? The answer to the Financial Times’ question is probably “more capitalism”. The Anarchist Bookfair collective affirms and promotes values of mutual aid, direct democracy, anti-authoritarianism, autonomy and solidarity. We reiterate our opposition to capitalism, imperialism, patriarchy, heterosexism, racism, colonialism, statism and all other forms of oppression; we will not accept anyone to participate in the Anarchist Bookfair that perpetuates or promotes these attitudes.